Ace’s friend Parker joined the daily adventure. 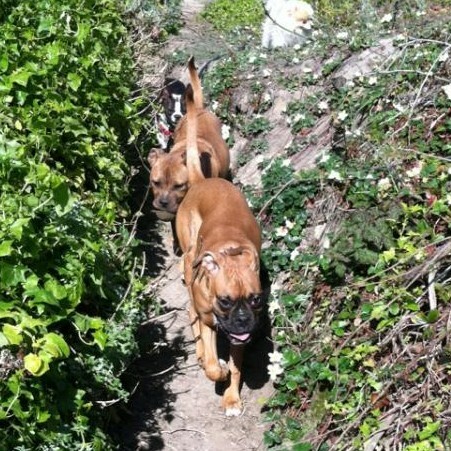 Ace, Jefe, and I had another lovely visit with Bay Area BTs and their people. It seems that people become friendlier, and dogs become cuter, with every visit. If you and your BT were at the meetup and we chatted, message me with your email address and I’ll see if I have any other pictures of your pup! 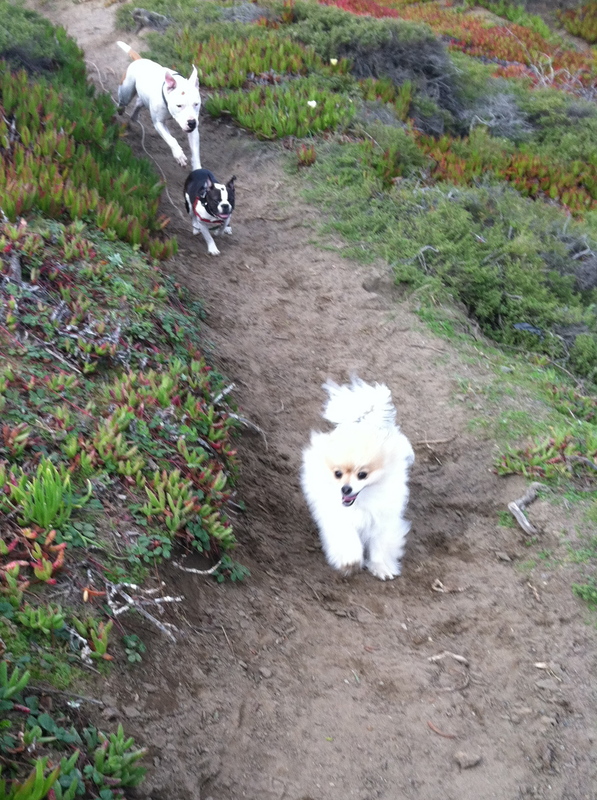 On Friday, I had the opportunity to join the Zip Dogs as they traversed Funston. 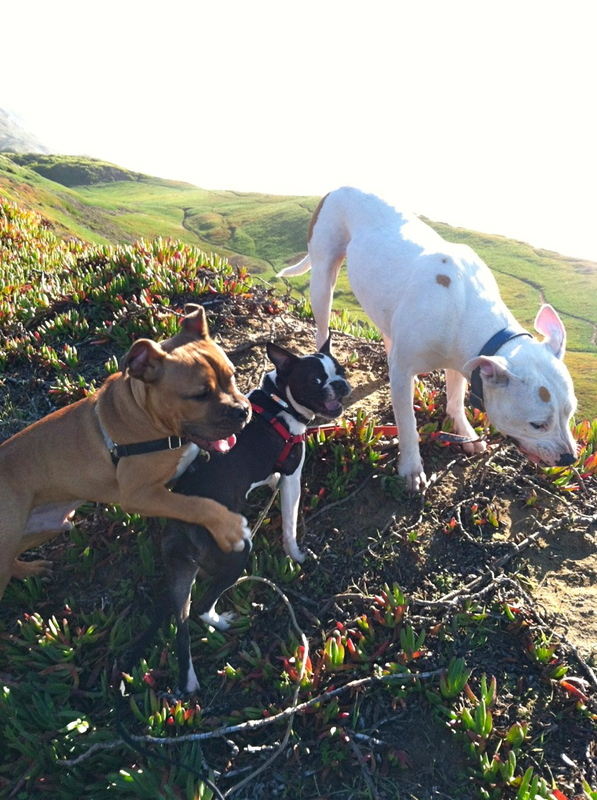 I got to meet Moo, Mister Jones, and Max, who were by now little celebrities in my doggie world. 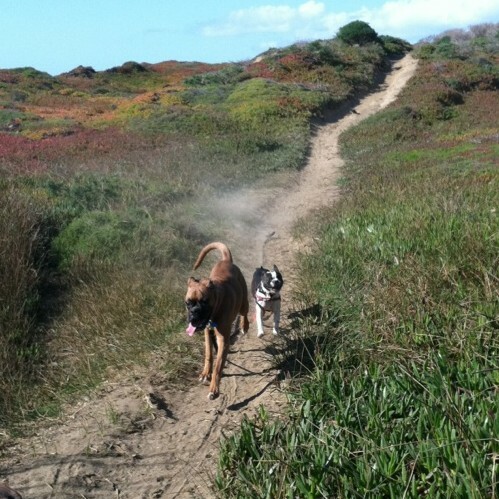 I came away with sore glutes and several observations as I meditated on my experience of four joyful pups and two happy humans enjoying the sandy side of San Francisco. 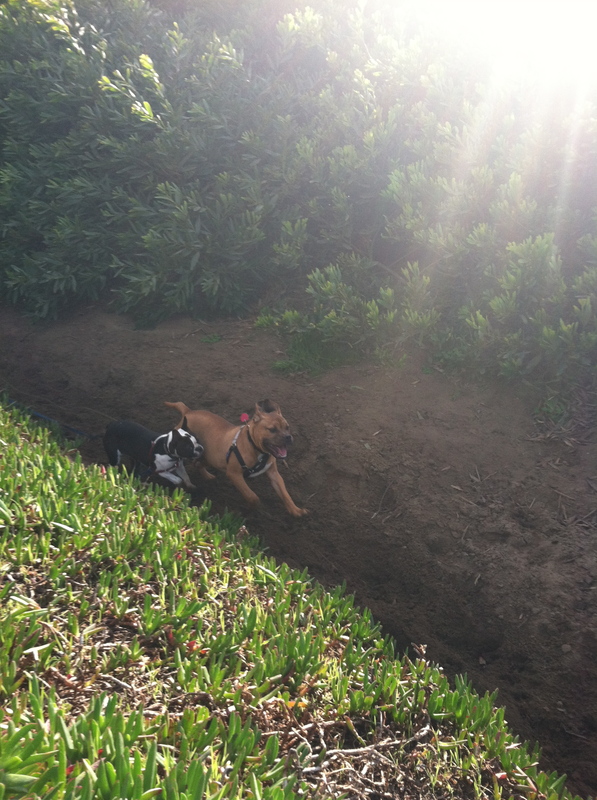 Let me share with you my favorite: As I struggled to throw myself vertically up a wall of sand, watching in embarrassment as the rest of the group effortlessly bounded away, Ace inevitably would hang back from her pack and wait for me. She didn’t seem frustrated or anxious; rather, she would wait calmly until, heaving and wheezing, I caught up with her, and then she would trot along ahead of me for a bit. It took the better part of a day for me to be able to describe the meaning of this interaction, though I knew it had affected me profoundly. My best approximation is that I experienced Ace’s loyalty towards me. No longer was she the tiny, dependent being I raised in my kitchen. She was out with her familiars, and I was their guest, obviously struggling. Further, I was her Mama, and Ace recognized me as her own, superseding her allegiance to the pack. I belonged to her. There was a particularly salient moment where I looked at her waiting for me patiently and seemed to see laid out before me all the years of her life ahead of us, and how we would always be bonded to one another. I saw myself caring for her in her golden years as tenderly as I had weeks after her birth. I suppose what I’m trying to explain is that I saw her as my companion, rather than my charge. And it was magical. Check out this interesting article on communication between dogs and their people. 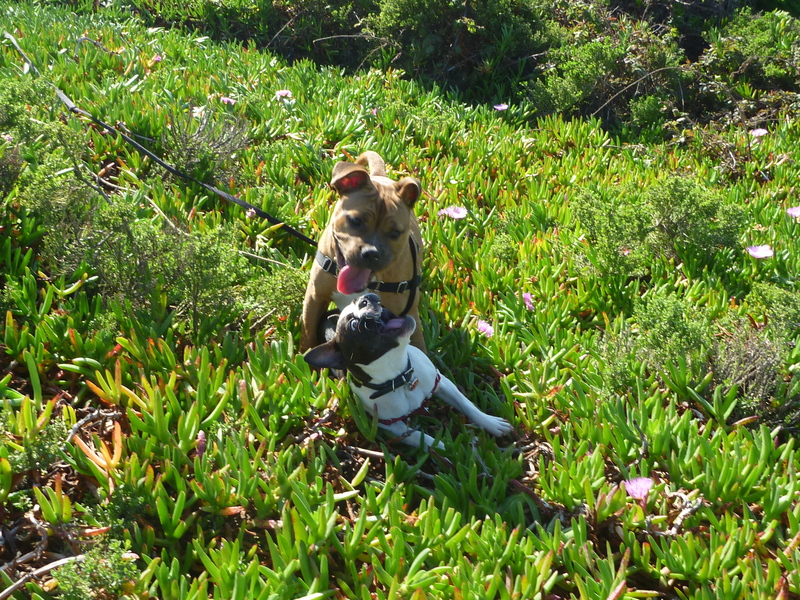 I connected with the author’s opinion that cuing your pup feels unnatural, when usually you are speaking and listening to one another without even trying. I’ve noticed this effortless exchange developing between Ace and I, and between Ace and Jefe (and really, between Jefe and I), the longer we’ve been together. Cuing is very helpful when a specific behavior is needed; for example, I only use the word “come” when I need Ace to return to me NOW, and I usually use my exuberant voice (okay, I have a few of these; I’m talking about the most exuberant one). But when I’d like her to approach me, I ask her in other ways: patting my lap, saying her name sweetly and softly, making a kiss noise, or simply gazing at her until she comes padding over. Dogs were bred to live alongside us, to observe us and to learn our world. It delights me to imagine that, the longer Ace and I are together, the better we will be at predicting and understanding each other. Together, we will feel more and more like home. He’s an American and English bulldog mix, about a month Ace’s junior, and they were inseparable all Valentine’s Day long. I thought I saw a hickey on her neck, but it was just some blood, probably from a loose tooth. 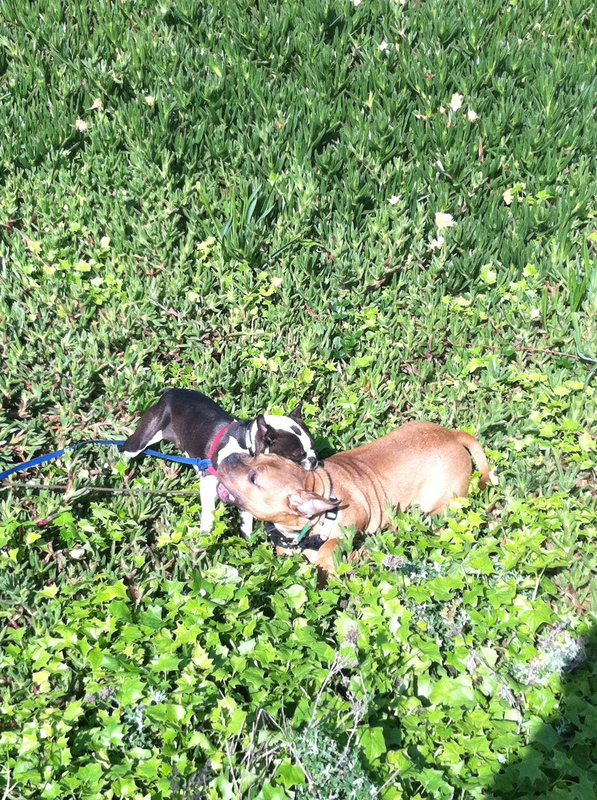 Love can be rough, especially for two dogs whose ancestors were bred for wrasslin’. 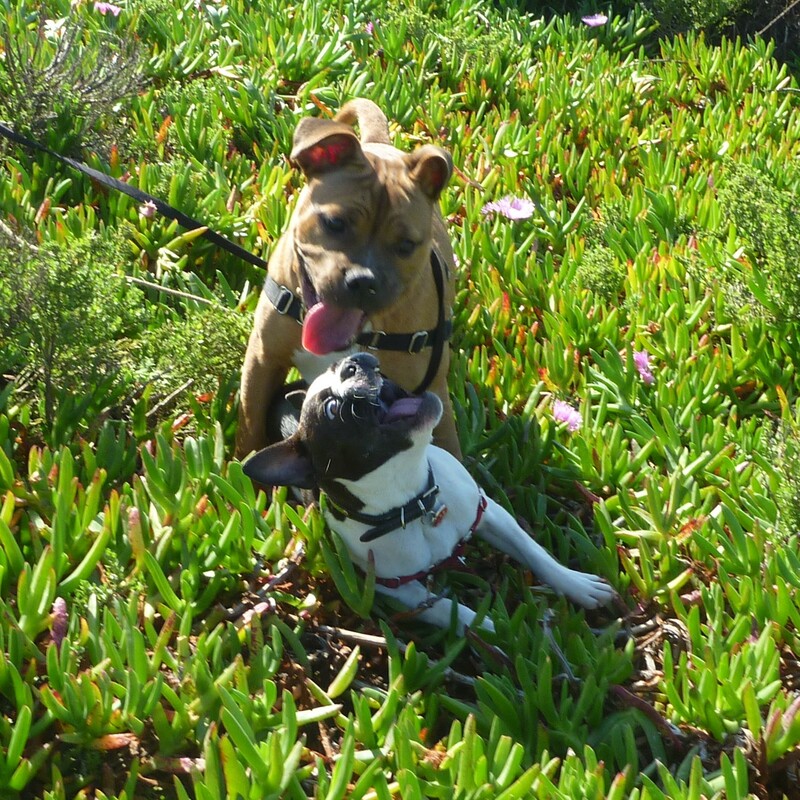 Whether this flirtation disappears in the wag of a puppy’s tail, or, like ice plant, sprouts meaty tendrils that grow and spread until they choke the native vegetation, only time will tell. If I’ve learned one thing about dogs, it’s that they live in the moment, and savor every bite and dig as deeply as their little puppy hearts can feel. 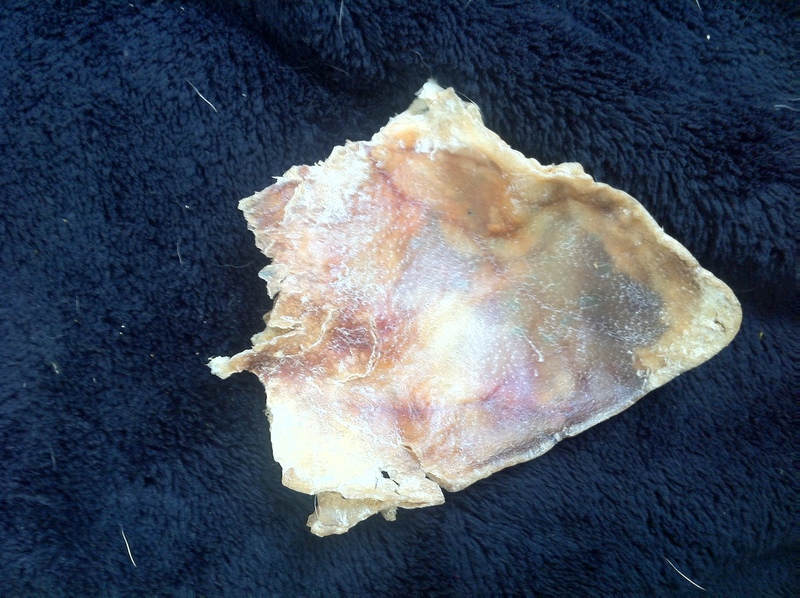 Ace gnawed this pig ear into a mysteriously heart-shaped lump of flesh. Or, as Jefe suggested, maybe she was trying to recreate a map of Africa. Either way, her valentine was enthusiastically accepted. 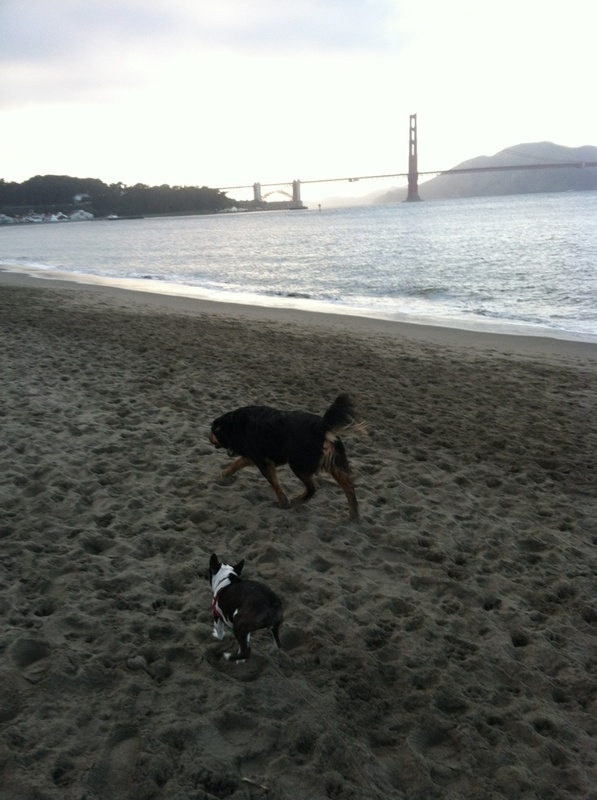 While Jefe and I spent four days soaking up the relaxation at a NorCal hot springs, Ace had a little vacation of her own with Rachel and Her Pack. Rachel “boarded” Ace, but really Ace was an honored guest in her home, a companion in her truck, and a cuddle buddy in her den. 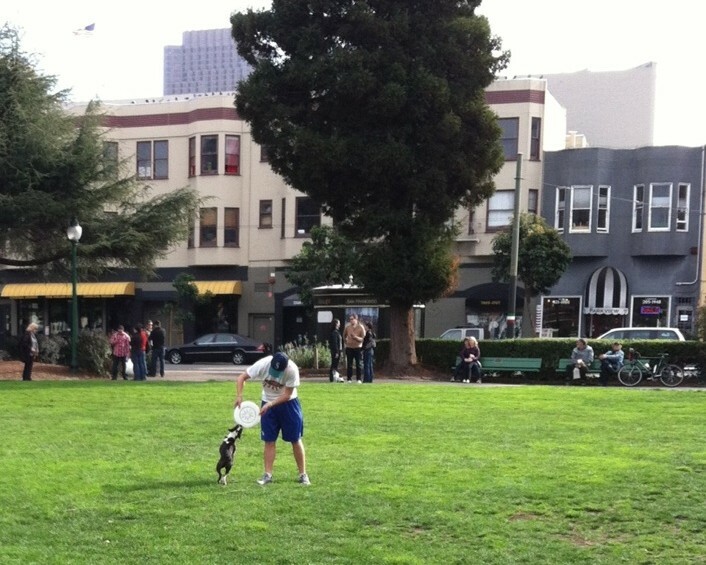 Ace spent hours at Funston on Thursday and Friday, took Crissy Field and a BBQ by storm on Saturday, and befriended some young men playing Frisbee in Washington Square on Sunday. When we got her home, she ate a meal and passed out cold on the couch for four hours until we carried her to bed. This morning she could barely walk, she was so sleepy. I think we all really needed a break from routine.